Kara Chan dances to music by Zach Hann and Jacob Wellman while Stephanie Galipeau looks on. Alice (Victoria Pollack) is overwhelmed at the Mad Hatter’s tea party. Eight years ago, in the aftermath of Hurricane Katrina, a group of Juilliard students went to New Orleans over spring break for a whirlwind week of outreach and performance. The trip was so successful that it has been continued ever since. This year’s version took 18 students from all three divisions and two advisors to the Big Easy, where they worked on a Habitat for Humanity house for three days, spent one day with the New Orleans Center for Creative Arts, and gave a number of workshops and a benefit performance for a community youth program. Third-year dancer Kelsey Connolly reflected on the experience. Kelsey Connolly and Jimmie Jeter move lumber. 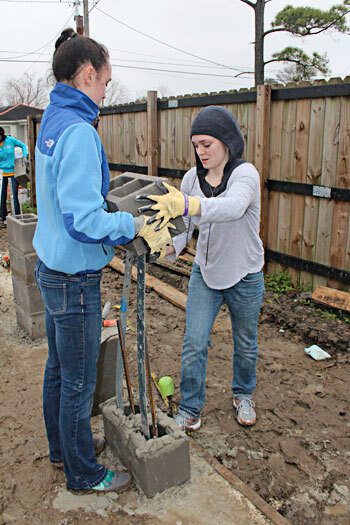 Angela Falk and Victoria Pollack stack cinder blocks for the house foundation. 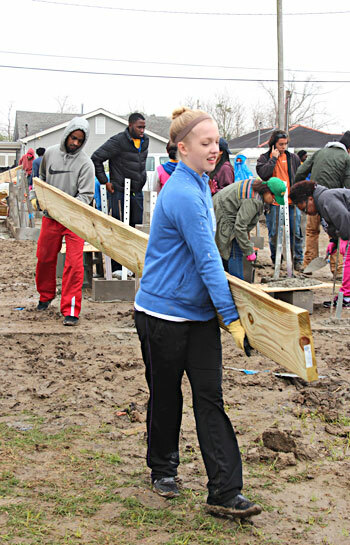 This spring break I took my third trip with Juilliard’s ARTreach New Orleans Service Project. It’s no easy feat making this project happen, and I have an even greater appreciation for past team leaders now that I’ve served as one. The amount of work leading to the trip was sometimes overwhelming as it included coordinating logistics for all of us, finding creative ways of raising $17,000 to pay for the trip, figuring out our New Orleans agenda, coming up with a performance program and rehearsing it, learning and teaching team-building games, etc. However, I had faith that our team would find a way to pull it together and make it happen—and we did! It’s incredible how much work can get done when each person on the team is fully committed, whether it’s laying wood panels on the muddy ground of the Habitat site so that no one would slip, grilling paninis for our team dinner even though it was someone else’s night to cook, doing dishes after a long day, or giving (very necessary!) massages. Practicalities aside, something I shared at the final team meeting is that this project represents what is to me the essence of Juilliard. After spending just one week with only a fraction of my fellow students, I feel more in touch with my art form and the effect art has on those around me, and, most importantly, why I wanted to come to Juilliard in the first place. I crave being around artists who can’t help but perform and entertain, who break out into song and dance because the music overtakes them. It comes from somewhere deep inside and cannot be taught, even in the hallowed halls of a famed conservatory. Although Juilliard certainly attracts artists of high caliber, the qualities that make us who we are as performers and as people are sometimes overshadowed by our desire to be perfect—and better than the next person. While technique is absolutely necessary—and a little healthy competition is sometimes needed—that quest for perfection can also be a hindrance. I have learned from this project not to always harp on the details or allow others define who I am, but to let go and be myself. Every single team member oozed talent, and seeing these talents put to use, sometimes in their most bare-bones state, is most inspiring. For instance, performing on a grassy, untamed lawn at Habitat—without a proper dance floor or acoustics or music stands or lights or sets or a piano to give us the A to start “Ain’t No Mountain High Enough” in tune—was extraordinarily liberating. It allowed us to simply love what we were doing while doing it, and our audience responded in kind. One special moment for me was after our performance at Trinity Episcopal Church, when a young girl whom I have taught for the past two years in New Orleans came up to me. She knew I was a dancer, but this was the first time she had seen me in my element. She looked at me wide-eyed, and could not stop hugging me. I realized that although our time in New Orleans is fleeting, the impressions we leave are lasting, and this warmed my heart. I am grateful that this project has been a part of my life and a truly defining experience in my Juilliard career. It’s important to venture away from New York in general and 60 Lincoln Center Plaza in particular to gain perspective and other life experiences—and to make genuine connections with those you may not otherwise find the time to meet and get to know. Make that time and prioritize it, because art is meant for bringing people together. Who are we in this world if we cease to make connections with other people? This article was adapted from a blog post that third-year dancer Kelsey Connolly wrote about the trip.